Sookie Stackhouse is back. She’s happy and she’s in love. Her romance with Vampire Bill is a few-months strong and for the first time, she has somewhere she belongs. But the peace she’s been enjoying can’t continue forever. The small town of Bon Temps is turned upside down again, when Lafayette, the flamboyant gay cook at Merlotte’s, is found dead in the backseat of Detective Andy Bellefleur’s car. But that mystery has to wait. Because Bill’s vampire-boss Eric is sending Sookie to Dallas to do a job. He’s loaned her out to the vampires there to help them find one of their own who has gone missing. Sookie uses her telepathic skills to figure out what happened to Russell. That draws her into the clutches of the nefarious Fellowship of the Sun, a group dedicated to the destruction of all vampires. 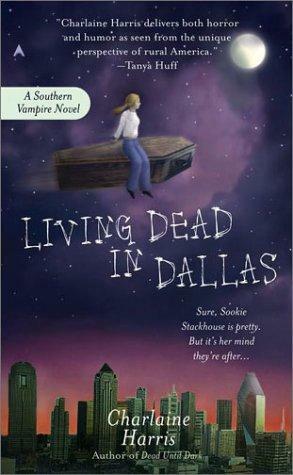 A lot happens to Sookie in this book. She meets Barry, a hotel bell boy who is also a telepath. She makes a big impression on the Texas vampires, including their leader Stan… who will be back in later books. For the first time, we get glimpses of the sizzling sexual tension between Sookie and Eric. And fissures begin to show in her relationship with Bill. We see, along with Sookie, what Bill’s lack of humanity really means. And she has to ask herself some very tough questions about what she can and cannot accept in her life. I enjoy Sookie’s voice. She maintains her spunky, country-girl mentality. She holds on to her own morality, though admittedly she doesn’t stay too rigid –she allows herself to recognize that some of her formerly held beliefs may have been naive and in need of adjustments. But Eric is definitely a shining star here… just a glimpse of the supernova character he’ll become. Season two of True Blood is based on this book. But there are some very big differences here. And I have to say, as with every season so far, other than the glory that is Alexander Skarsgard, the show is vastly substandard to the storyline in the book. There is a maenad, but it’s only a very small part of the storyline. Lafayette is the body in the car, because there is no Miss Jeanette. Tara is not Lafayette’s cousin. In fact, her role is very small and her character is nothing like it is the show. Oh yeah. And Godric is not the kidnapped vampire. He was the bait that helped kidnap Russell. And he’s not Eric’s maker. He is a child molester and killer. Just read the book. Can’t wait for Dead Reconing! I’m about three books behind but I so do enjoy this series. I totally agree with your thoughts on Sookie! Great review as always Jen!